So it’s been awhile since I’ve blogged. Life has been busy and to be honest, I wasn’t doing much baking for a while. But I have missed the baking and the blogging so here I am. The temperatures are cooling off and fall is definitely here. Jack Frost is working his magic and each day brings a new masterpiece to the foliage that lines our streets. With fall brings the thoughts of consuming apples in all types of sweet treats. When we were in Minneapolis a few weeks ago we stopped by Rocky Mountain Chocolate Factory and indulged in one of our favorite treats — caramel apples! My favorite is the turtle while Marshall loves the apple pie caramel apple. I kept thinking about that apple for days afterward and finally decided I needed another one. Since I couldn’t just stop by and get another, I decided I would need to make my own. Having never made one before, I was a bit nervous as to how to go about it. But the internet did not fail me and before long I had lots of good advice to help me along. I decided to try using Peter’s Caramel and I was quite pleased with it. It had a nice flavor and was easy to work with. I microwaved the caramel and then dipped the apples. I had seen some pictures of chocolate dipped apple slices on Pinterest and was interested in doing caramel apple slices. 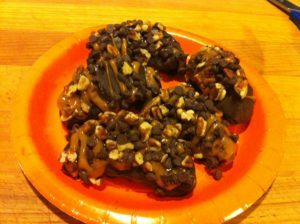 I tried everything I could think of but I could not get the caramel to stick to the cut part of the apples. It coated the skin just fine though, so dipping whole apples was not a problem. After letting the caramel set up in the fridge, I dipped them in tempered chocolate. For the slices I ended up having to dip them in chocolate first and then add some caramel. I have to say that I felt my apples were just as good as the ones we had a few weeks ago. I even tried making the Apple Pie Caramel Apple last night and was told it was right on the money. 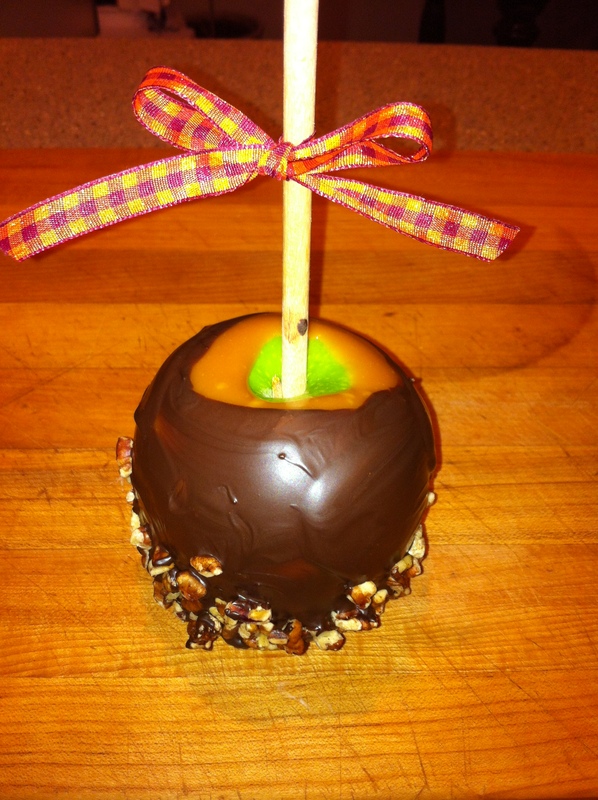 I would definitely encourage everyone to try making their own caramel apples. It was lots of fun and super easy! It’s been a while since I’ve posted. I haven’t been doing a whole lot of baking these days because I’m working a new job and the hours are really crazy. I have some things planned though and will be working on them soon. In the meantime, I just thought I would tell you about the most amazing day that I had. First of all, I came home from work to a clean house and lunch on the table. Yes, since I start work at 3 a.m. I am getting home from work at lunch time and I’m usually ravenous. I have been spoiled the last few months to have Marshall at home and he has been a great support to me. He gets up with the dog at night so that I can get as much sleep as possible. He runs errands for me so that I don’t have to do them when I get home. And he always cooks me that best meals because as you all know he is THE BEST CHEF ever. Yeah, I am one lucky girl. Anyway, on said amazing day, my husband also brought me some beautiful flowers. And these weren’t just flowers that he picked up at the store while he was there (not that I don’t appreciate that when it happens) but he had ordered a custom arrangement with lots of beautiful spring flowers. I was feeling pretty special. A few hours later a friend of mind stopped by for a prearranged visit. She came with her Mom and Dad whom I had never met but were visiting from out of town. When I opened the door, her Dad preceded to bring in and set up a beautiful stained glass lamp that he had made just for me. It is such a beautiful lamp and it is the perfect colors and design for me. I could not believe it! My friend’s parents knew everything that we have been through over the past two years and they just wanted to do something nice for us. You see, I am friends with two of his daughters and I had seen lamps that he had made for each of them. I had commented that I would love to buy a lamp from him someday but was told he only does it for a hobby and would never accept an order. I feel so honored that someone would spend so much time and expense in making such a gift for me. (Each piece is hand cut and pieced together so you can imagine how much time this must have taken). 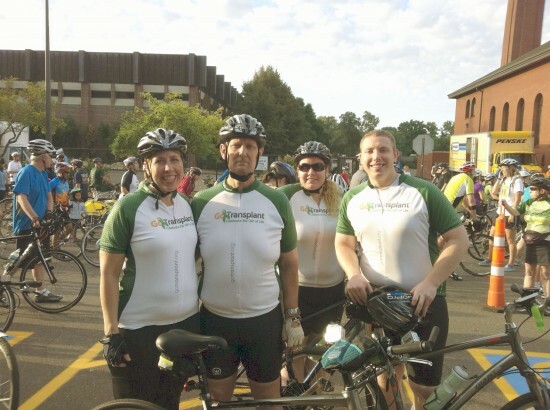 My family had such a great time this last weekend riding in the St. Paul Classic. This is something that my kids and I decided that we wanted to do several months ago. We really hadn’t ridden our bicycles for quite a while, so we decided it would be the perfect goal to get us a little more active and healthy. Marshall had recently undergone his surgery so we figured he could be our support person and hopefully join us next year. But as we got excited about cycling, Marshall did too and he joined us on our preparatory rides. He has had such an amazing recovery and has progressed so far in just a few months. As it became clear that Marshall would be joining us on the ride, we thought it would be fun to ride as a team and promote awareness for organ transplant too. We had quite a few people ask us about our jerseys and it was pretty exciting to tell them that Marshall had his transplant just 101 days before. We ended up having great weather and the ride was a lot of fun. This past weekend I had the opportunity to make a very special cake — and I mean a VERY special cake. 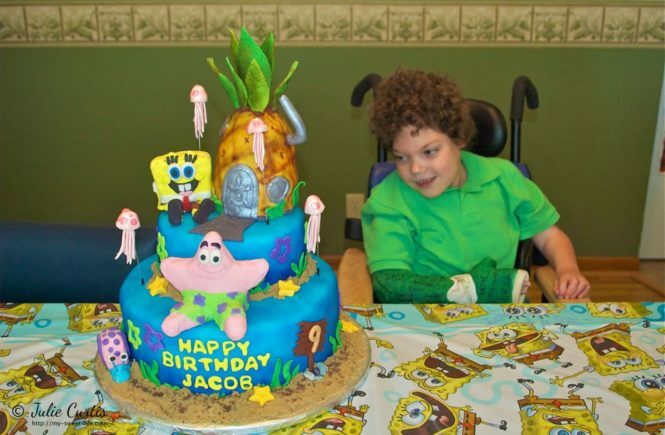 You see, about six months ago I joined a nonprofit organization called Icing Smiles. I am posting today in honor of my grandmother, Stella Buck. I have many fond memories of visiting her while I was growing up. Her birthday was the day after mine and it always felt special that our birthdays were so close together. 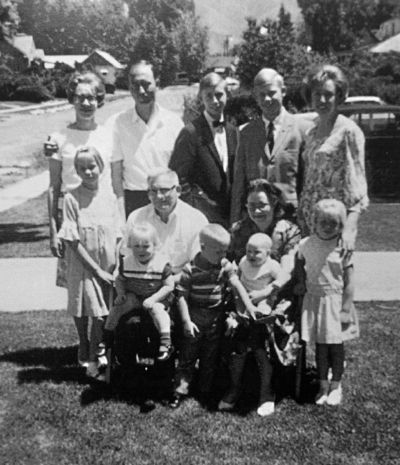 Grandma had six children and they all had large families so I remember lots of cousins at our family gatherings. My favorite memories are of our Christmas Eve party with the entire family. We would always read the nativity story, peel oranges by the fire and of course open gifts. One Christmas that stands out in my mind is the year that she sewed each of the grandchildren a robe. It felt so special that she had selected the fabric for each person and spent so much time to make them. Grandma was an excellent seamstress which was a very useful talent to have when raising a young family during difficult times. 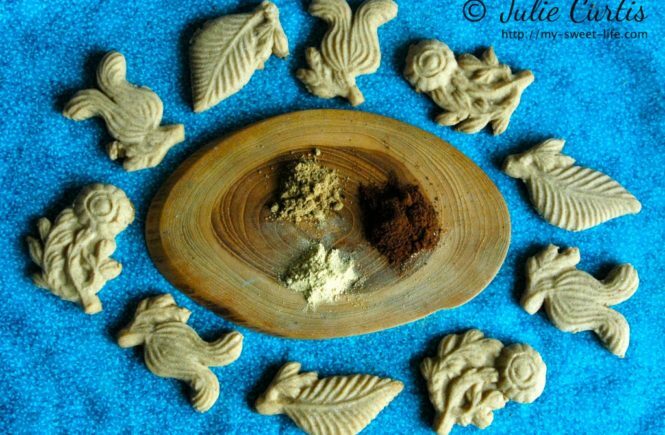 At that time flour came in fabric bags with different patterns on them and she would use them to sew shirts for her boys. Her friends and family would give her old coats and men’s slacks and she would remake them into clothing for her children. She spent many hours teaching my mother to sew and when my mother got married they sewed her wedding dress together. Grandma also had a talent for baking. She was well known in her church for the pies that she would make and also made great bread and rolls. In addition, she would spend each summer canning fruit so that it could be used the rest of the year. My grandmother was very active in her church and set a wonderful example of how a person should live. I used to love to stay at her house and go to church with her. 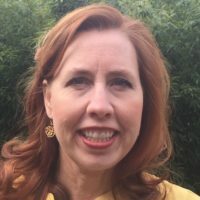 She taught the young children for many years and she had a great desire to go on a mission. As soon as she and my grandpa could retire they committed to go. It was while she was in the mission training center that she was diagnosed with ovarian cancer. Grandma insisted that she wanted to continue with her plans even though it meant receiving chemo therapy while being away from home and living in another state. After about six months her health forced her to return home and she died several months later. I feel like she was cheated out of so much of her life. So many people look forward to the time that they retire and she never got to enjoy that time when it came. 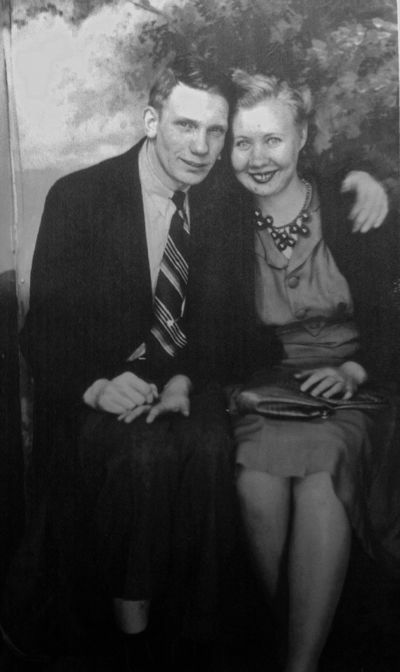 I was newly married when she died and so we never got to have that adult relationship and she never got to see my children. I am joining in Frosting for the Cause in the hopes that some day doctors will be able to detect ovarian cancer much earlier so that mothers and grandmothers can be with their families. Because I remember my grandmother being such a good seamstress I decided to decorate some cakes with a sewing theme. Heat oven to 350 degrees. Combine ingredients and pour into greased 8″ or 9″ square pan. Bake in oven until done, about 20 minutes. While your cake is baking you can prepare your fondant so that it will be all set when you are ready. 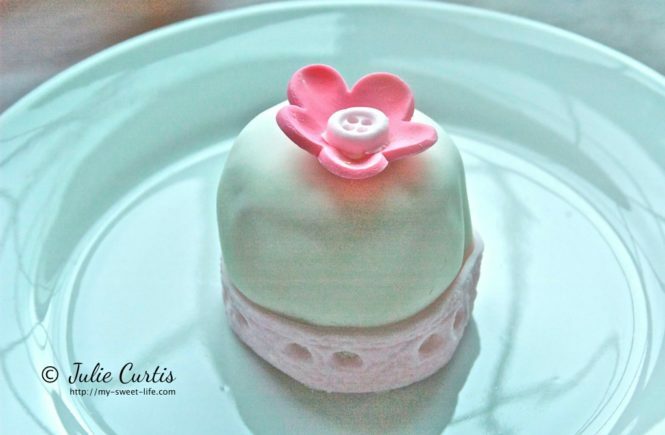 Recently I’ve been using homemade marshmallow fondant. It has a great taste and is so much cheaper than storebought. 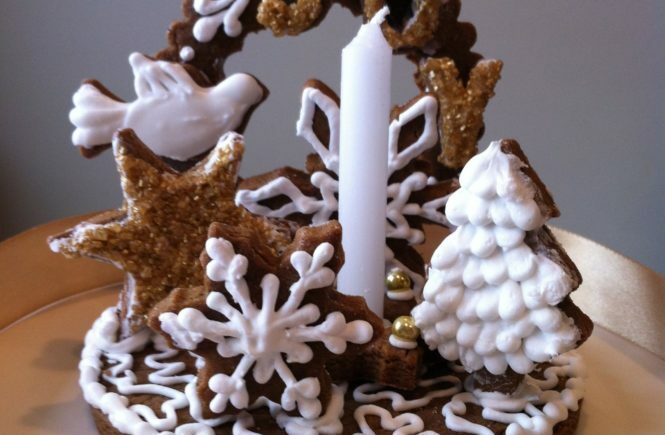 The recipe is readily available online but there is a great tutorial by Cookies&Cups here. After the cake is cooled, put the two layers together with frosting between. Cover the cake with saran wrap and refrigerate overnight. The next morning, make your mini cakes by using a 2″ round cutter and cut out as many rounds of cake as you can. Lightly ice the tops and sides of the mini cakes. Now cut out fondant circles with a large round cutter (about 4-1/2″) and smooth down over each cake, and trimming nicely around the bottom. 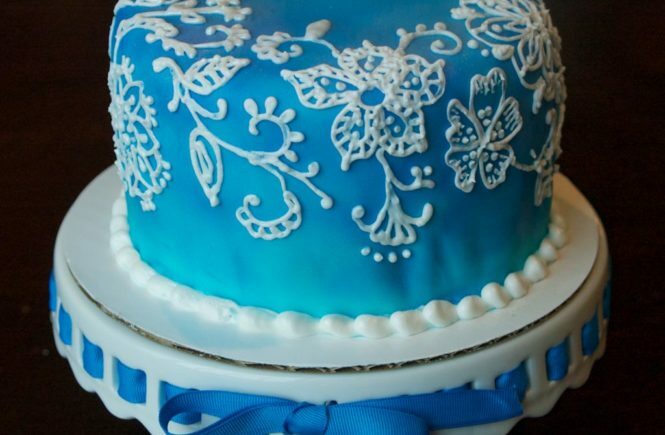 To make the lace you can use a fondant mold or use regular lace from the store. 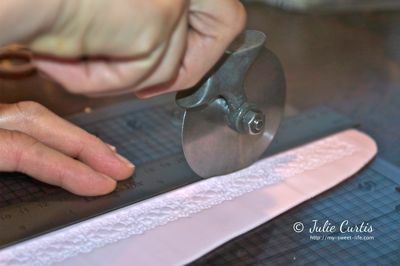 I would like to show you how to use store bought lace to make a fondant border. Purchase real lace the width that you desire. When purchasing the lace, think about what pattern would impress well and not be too difficult to cut. For example, I stayed away from large scalloped edges because I wanted to be able to make a straight cut and still have it look good. If you are just making one large cake then you might not mind cutting a detailed edge but since I was making numerous cakes I wanted to keep it simple. 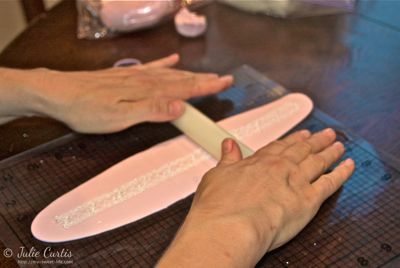 Roll the fondant out to about 1/4″ thick and lay the lace down on the fondant. I found it was best to cut about three pieces each time I rolled the fondant. 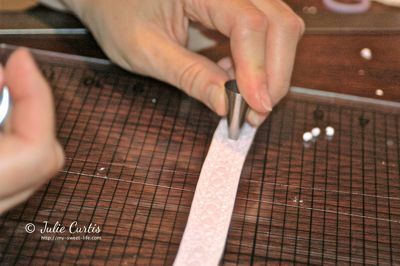 Once the lace is in place, roll the fondant roller over the lace, pressing down fairly hard as you roll. You can pull the lace off at this point or wait until the end to pull it off which actually gives it a little more stability while you are working with it. Make straight cuts along the impressed edge with a pizza cutter. If you want to add some decoration and make it look even more like lace, use a decorating tip to cut out holes or designs in the lace. Again, this can be quite time consuming so it depends on how much detail you would like. Use a paintbrush to push the small dots out of the tip. 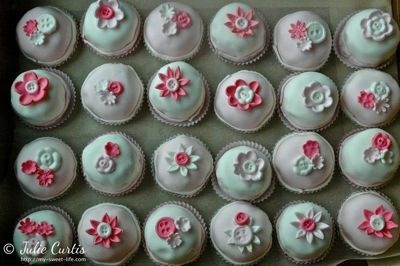 Top the cakes with fondant flowers and buttons. 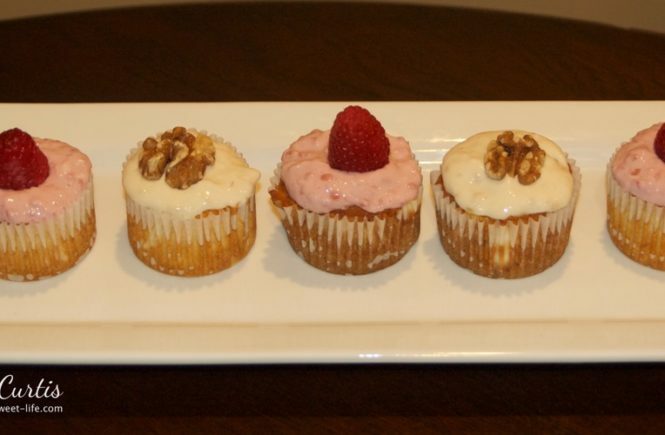 I really enjoyed making these mini cakes and I took them to the Sandra J. Schulze American Cancer Society Hope Lodge. This is a wonderful place where cancer patients who travel to Mayo Clinic can stay while receiving treatment. I am pleased to have a guest posting today over at Frosting for the Cause. The purpose of this site is to raise funds for cancer research and to raise awareness of how we are each touched by cancer. 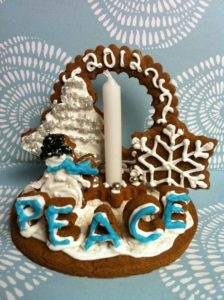 In addition to making a monetary donation each participant bakes something, donates it to a local cancer hospice, and then blogs about what they made. Tell me it isn’t true! Twenty years ago my baby girl was born and now she’s a beautiful grown woman. Age certainly changes your perspective of time. When I was expecting, I receive some advice from someone who had a five year old. I remember thinking not only that this person’s advice was rather dated since it was FIVE whole years ago, but it also seemed like it would be a lifetime before my own baby turned five.